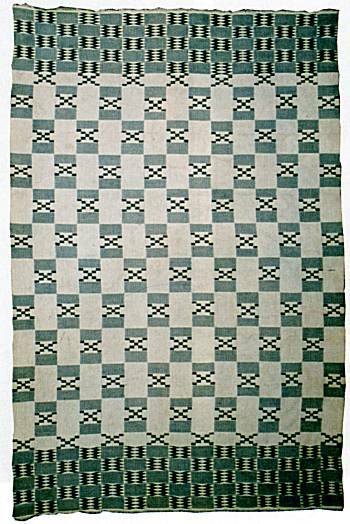 Brigitte Menzel (1930 - 1998), the german ethnologist travelled in Africa in 1962 and 1986, and she was collecting textiles from Ghana, Nigeria, Mali, Ivory Coast, Kamerun, Marocco. The exhibition mainly shows fabrics of the Ashanti tradition from Ghana. And this is not a coincidence. In 2007 Ghana is celebrating its 50 anniversary of independence. On March 6th, Dr. Kwame Nkrumah guided the colony Goldcoast into independence and this was the first African country to become independent from the British Colonial rule. Womens dress: the pattern blocks show as ornamentation the name of a famous Lady of Ashanti history. The word Kente refers to a fabbric made from several singel stripes. These stripes of silk and cotton material were woven on a special narrow loom. In former times all pattern and colors were not chosen at pleasure. They had to be assigned to the families and clans of the Ashanti people. Today Kente pattern can be found with more simpel techniques and also machine made. . The pattern may even be printed on cotton as piece goods in textile factories. 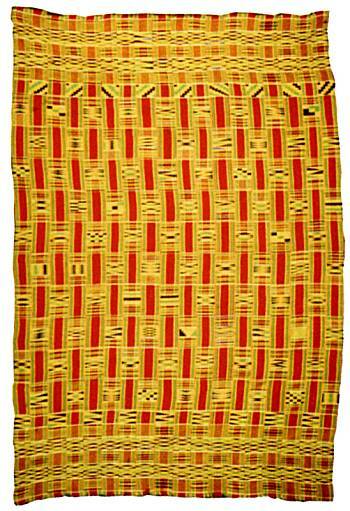 A tipical Kente dress for men usually is composed of 20 to 28 stripes of fabric, all 8 to 12 cm wide and up to 350 cm long. Dresses for women are about 250 cm long and have 12 to 20 stripes of fabbric.